This week is about Hirst building up the next battle and alliances. Judith dies of breast cancer. 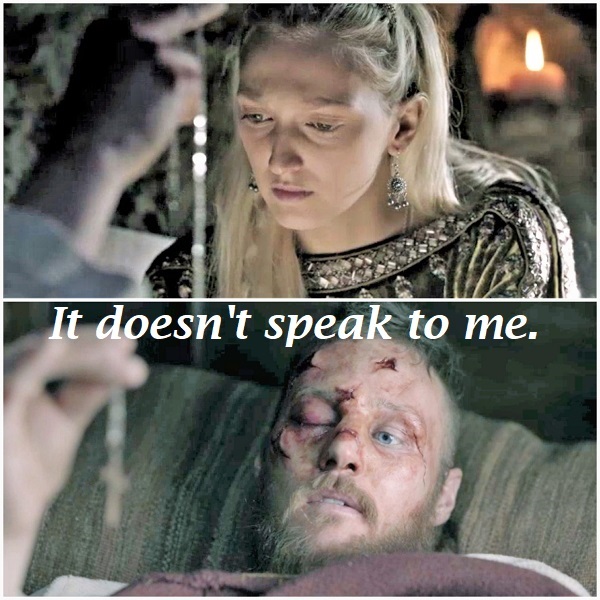 Lagertha reminds Alfred that his mother’s actions were to secure his throne. We see additional footage of Lagertha after the battle and with the healer. I say “footage” because it isn’t exactly a scene, and it reveals nothing we didn’t already know. Their only purpose is to show Lagertha, but her presence serves no purpose. Her presence seems forced this week. Ubbe kills King Frodo in hand to hand combat, stopping the Danish incursion. Hvitersk and King Olaf’s men move towards Kattegat. 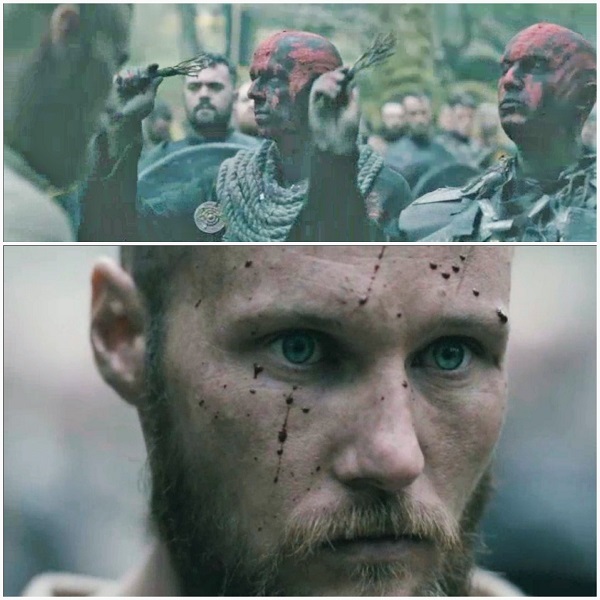 After being blown off course, Bjorn finds and joins forces with Hvitserk. Hvitserk is a new man. He finally knows his purpose. Did he know that poor Thora would be killed? Did he leave her to die? 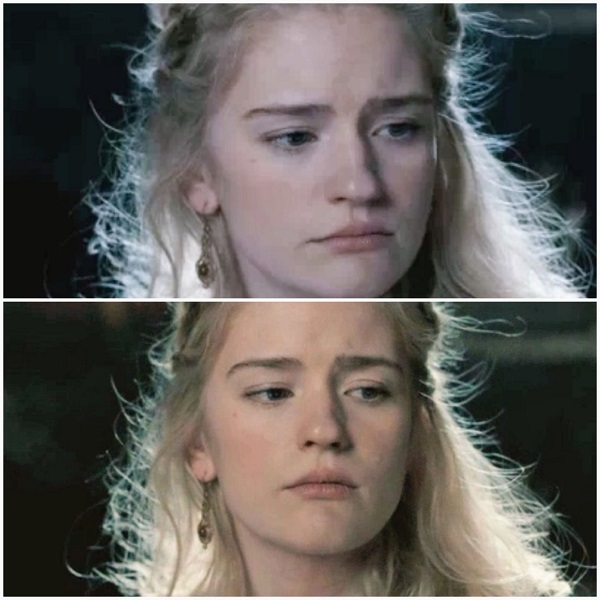 Freydis is not happy about Baldur’s death, and admits the baby was a just child, not a god. 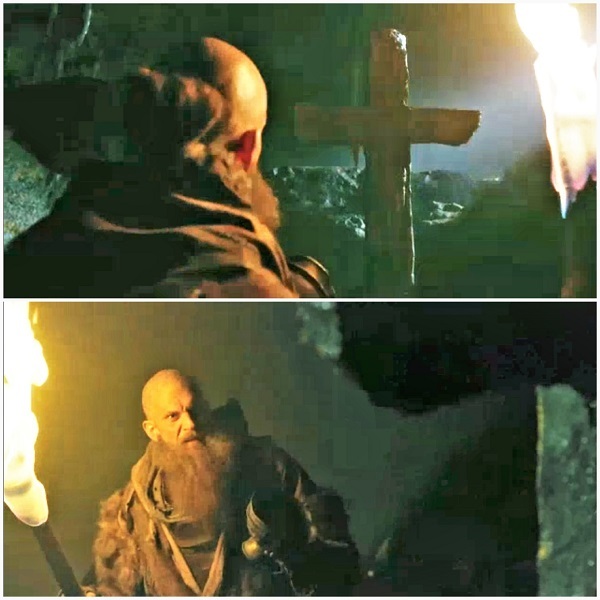 And Floki travels deep into a cave, looking for the gods. Here are a few of the moments that I really enjoyed this week. Floki travels into the depths of the Volcanic cave. At the end of the cavern he finds a cross and a chalice. Is this supposed to be the Holy Grail? Have Christians already been here? 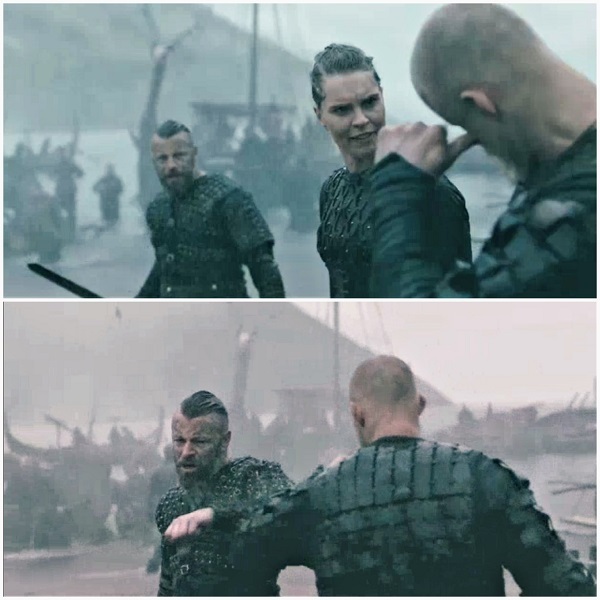 Or are the gods playing the cruelest joke on Floki? The bigger question is, “Is Floki still alive?” As if his screams are being answered by the gods, the volcano erupts. He’s knocked out after the quake. 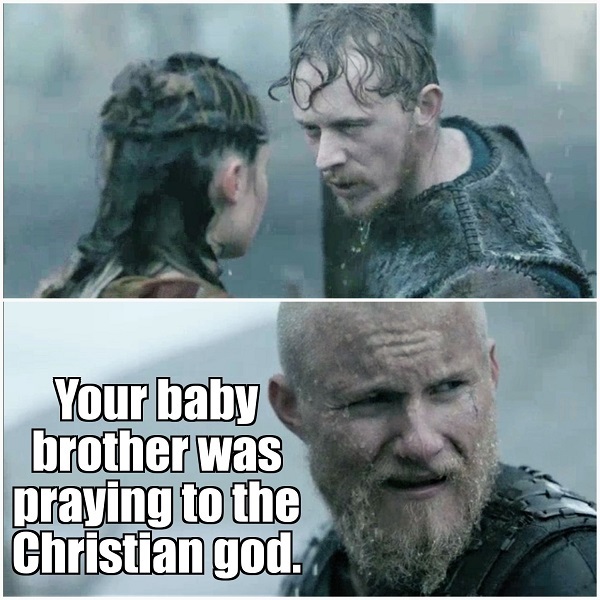 It would be really cruel if archeologists find Floki in a thousand years and think he was a priest! Bjorn starts acting as if he has command of Harald’s men. And Harald acknowledges that the two will eventually have to kill each other. Harald is the only character left on the show, who can bellow the obvious, almost stupid dialogue, and make it seem natural. They decide to finish each other off right then. Grunnhild stops them with another punch to Bjorn’s face. Bjorn still needs someone to make decisions for him. 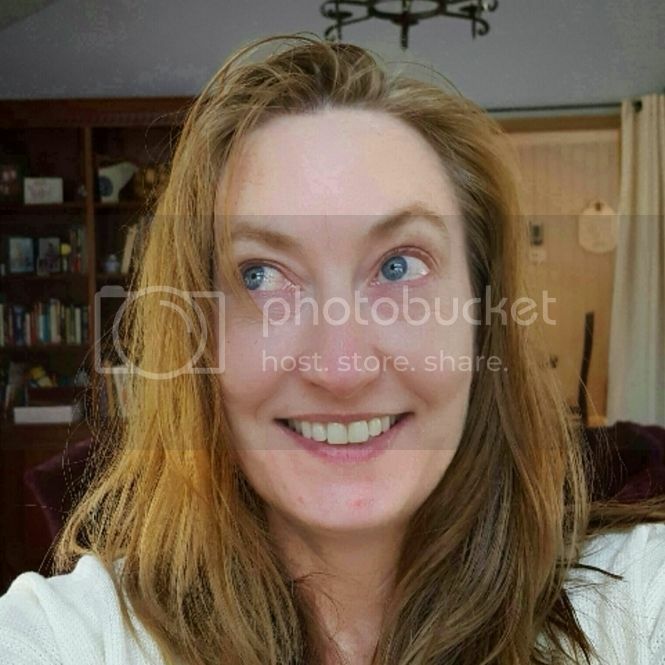 Either she thinks the two men need each other, or she’s still keeping her options open with both men. After calming down, Harald and Bjorn give each other “bro nods” and bump forearms. I think these two actually like each other. It’s strange to me that Torvi is happy that Ubbe has gone back to the “Old ways – the ways of their fathers.” How can they be the “Old Ways” already? They haven’t even been Christian for one generation. Bjorn assigns a shield maiden to babysit the landlubber, Magnus. He isn’t having a good time on the boat. When he thinks he might go overboard, he prays to Jesus to save him. He claims it was a habit from his childhood. The shield maiden tattles to Bjorn about it. Is Bjorn suspect of him now? I think Magnus will end up in Harald’s court and convince Harald to convert. 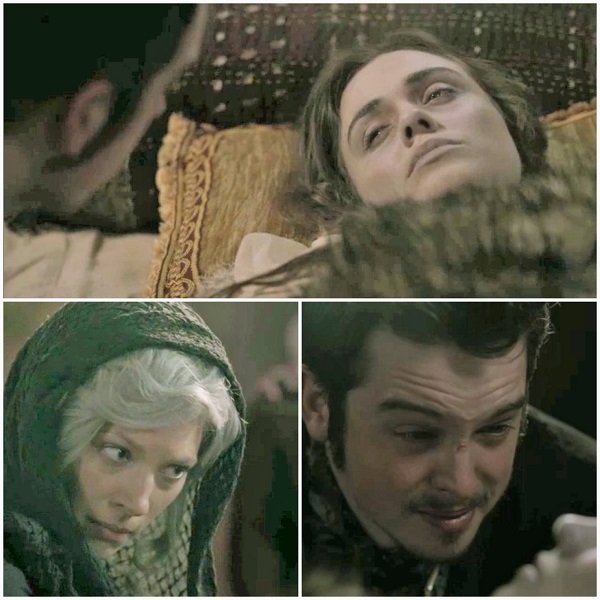 Freydis has been harassing Ivar to give her the baby back. For the first time, I didn’t like Ivar. I felt sorry for him as he stumbled into the Great Hall. I had hoped he had left the child out to die, out of compassion. The child would have died slowly of malnutrition. But Ivar is more concerned with the child’s deformity and his image. 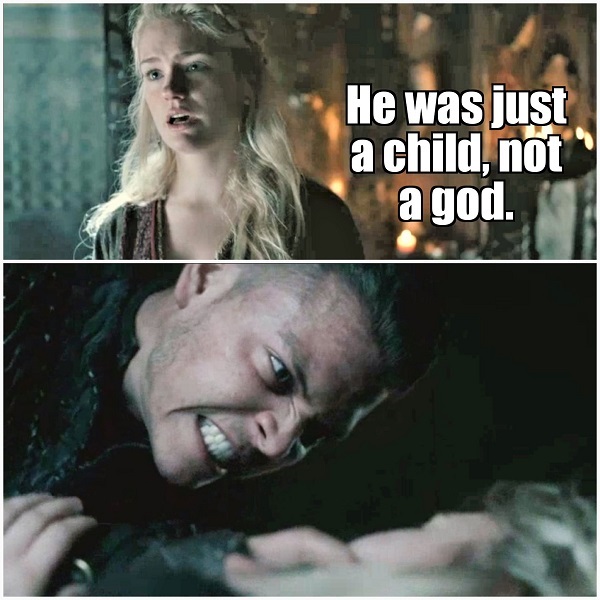 Freydis lets him know the child was not divine. He tries to strangle her, but stops for some reason. 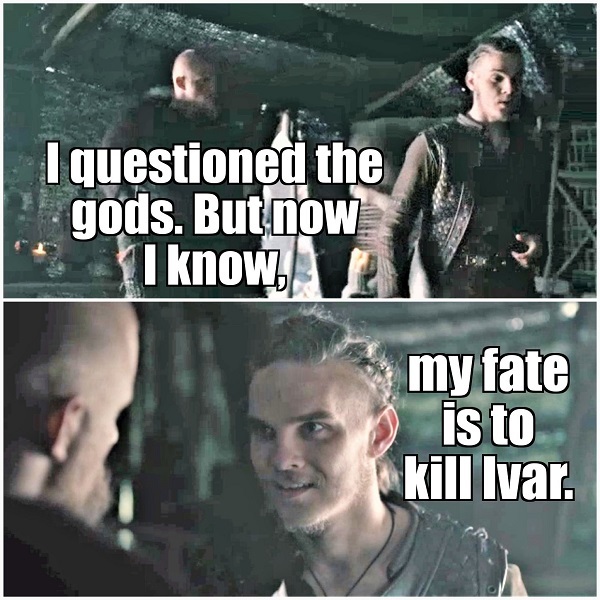 Now, Ivar is not everyone’s cup of tea. But I love him as much as Ragnar. But I lost respect for Ragnar when he hit Aslaug, so Ivar has been knocked off the pedestal I put him on. 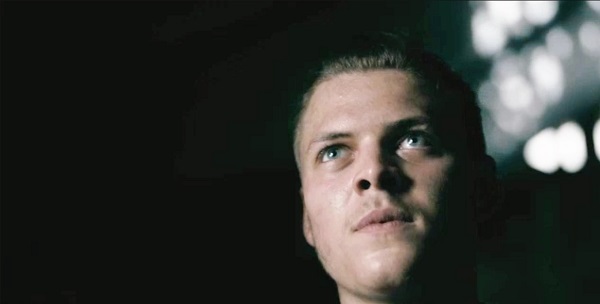 Part of Ivar suspects the child wasn’t his. If that is the case, he has to also admit he isn’t a god. Freydis convinced him of that too. 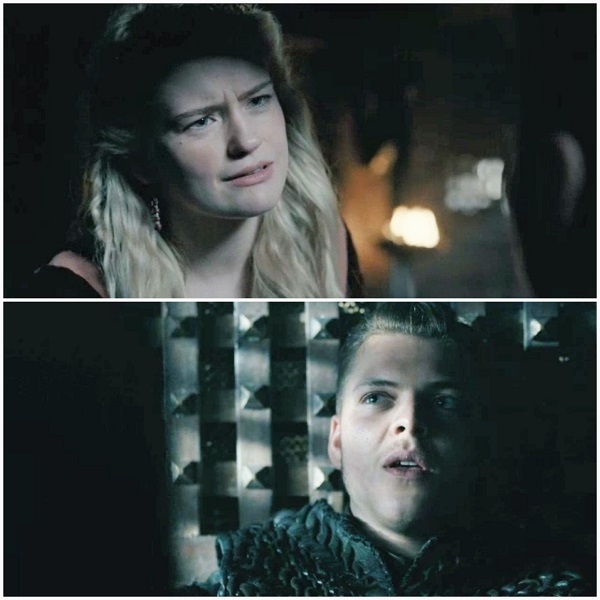 Freydis, who has always been genuine with Ivar, now thinks of him differently. Her grief has subtly transformed her perception. Is she going to plot against him? 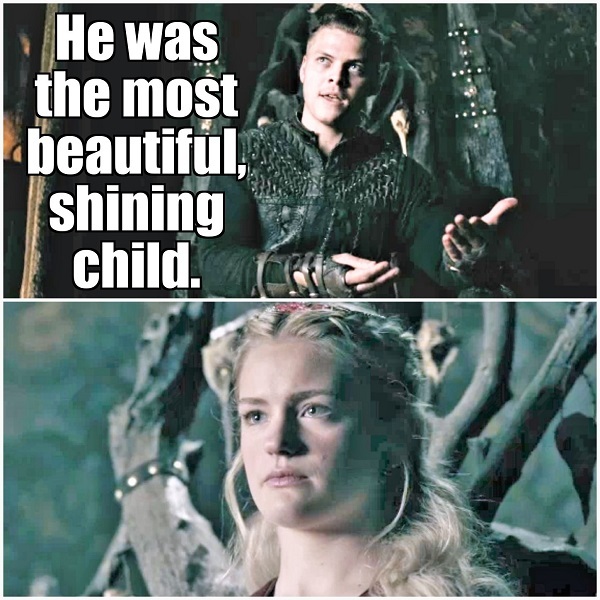 Publicly Ivar explains that he did produce a child, the most beautiful child ever. He lies to everyone about the deformity. And Freydis has become stone. Why didn’t he kill her? And will the midwives need to be killed to keep the secret? Ivar shifts the discussion to defending Kattegat. Instead of taking York back from the English, he wants to fortify the Great town of Kattegat’s defenses. 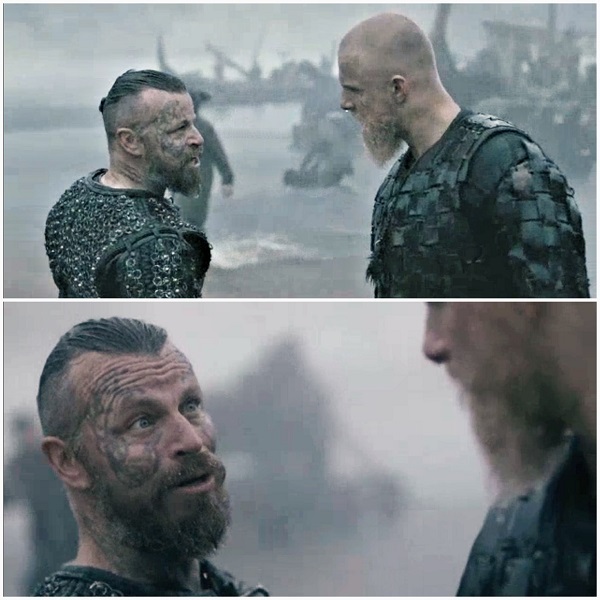 So Ivar has enough information to know Harald has abandoned York. But no one else around him is smart enough to put one and one together, and understand that Harald abandoning York, probably means he’s heading their way? And Hvitserk not returning, at least means Olaf has turned on them? Will someone figure that out that this is about Ivar covering his miscalculations? Will Ivar allocate all resources to a wall around Kattegat? If he does, it’s already too late – two caravans are on their way. Next week is the last episode of the season. My guess is, there will be a build-up of betrayals and cliffhangers before next season’s battle. Or we’ll have a battle, and end the season, not knowing who gets buried until season six. Stay tuned next week to find out!